I run workshops for individuals or small groups at my studio in Shere. Contact me for more info and availability (Monday-Fridays and Saturday mornings). After a brief demonstration of welding you get to make simple designs in metal, for example hanging Christmas tree decorations. •	Drawing your design and making a cardboard template. •	Cutting out your design in metal using tin snips and a guillotine. •	Shaping/texturing the metal using hammers and chisels on an anvil or wooden block. •	Drilling holes, filing and cleaning the metal. •	Using the oxy acetylene welding equipment to melt edges, braze or heat for colour effect. 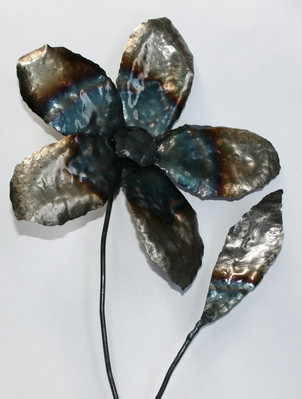 After a brief demonstration of welding you get to make a simple flower design in metal. •	Using the oxy acetylene welding equipment to make your sculpture, melt edges, braze or heat for colour effect. 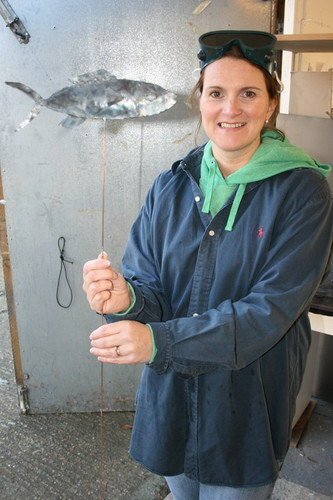 After a short lesson in welding you get to design and make a simple metal sculpture that would hang on a wall or stick in the ground, for example flowers, butterflies or fish. •	Learning to use the oxy acetylene welding equipment. •	Designing your sculpture and making a cardboard template.